The Margate Central ward has finally been declared as vacant following two previous failed attempts by Thanet council. The declaration follows failed attempts to approve a motion to declare the ward vacant at a meeting on October 15 following the disqualification of Cllr Ian Venables and then another failed motion to authorise the chief executive to declare the vacancy at a meeting on November 6. The refusal to approve the move resulted in reports that some 26 councillors received emails saying they could face High Court action if a motion was not agreed. 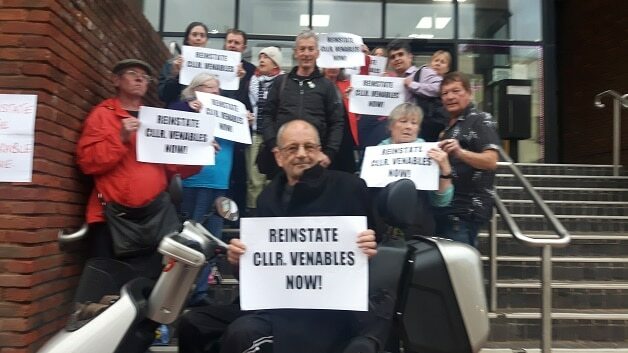 The wrangle centred around whether Ian Venables was rightly disqualified from his councillor role after taking a post with new homelessness team RISE. But there was dissatisfaction amongst councillors with the legal argument over whether Mr Venables had been rightly disqualified and the lack of information regarding legal advice to the council. Local government rules mean a by-election cannot be called within 6 months of a full election taking place – district councillors are due to go to the polls in May. The meeting on Tuesday (November 27) was the final attempt to approve the declaration. Initially it was to have excluded the press and public but councillors voted this down -meaning the details are now published. The report to councillors outlined legal advice which said the disqualification of Cllr Venables was correct because although the Forward Trust is his employer the new role that position is being funded by Thanet council. The declaration has now been approved although a by-election cannot be called and the post will remain vacant until the local elections in May. So Cliftonville residents have no representation at TDC? So Margate electors are denied the councillor they voted for to represent them at TDC, based on mis information given to cousil resulting in this abuse of local democracy. Cllr Venables was head hunted by the Council to fill their need, he never applied for the role, and they had advised him that there would be no conflict, then they suspended him. Totally underhand and totally against the concepts of justice and democracy. Barry Lewis. Talking garbage as usual. Ex Cllr Venables is in a paid position which is is funded by the Local Authority which he is now a former members. Under your interpretation, Cllr Lewis, a person could work for a Council and also be an elected member of that Authority. A total conflict of interest! Laurence, you are either unaware or are ignoring the fact that Councillor Ian Venables raised the issue of his role as a councillor at the time his new post with his long-term employer was offered. The employer sought guidance from TDC and was advised that there would be no issue since he would not be directly employed by the Council. By changing its position after the fact, TDC has now laid council tax payers open to a considerable charge from Mr Venables should he choose to take it to court. If its current legal position is correct, it should have taken cognaissance of this possibility and sought to renegotiate the contract and/or Mr Venables position within it in a rational and responsible manner rather than being driven gleefully to pursue a partisan political agenda. When all’s said and done, Mr Venables has spent decades working with and for the homeless people of Thanet (whose numbers this Government has greatly increased, putting even more pressure on all councils including TDC). He has also chosen to serve the people of Margate as their councillor and has been elected to do so by residents. Now, through its own ineptitude, compounded by the political spite of special interests, TDC has caused a great distress and loss to a dedicated public servant, and laid council tax payers at risk of needless expense. I would also like to add whether, in support of its current legal position, TDC it will issue a clear statement that is bound to disbar ANY councillor employed in any capacity, directly or indirectly, by ANY company that is contracted, now or in the future, to perform services by TDC. This will avoid distress and financial loss to either councillors or to the companies who might be thinking of hiring them – even indirectly – now or in the future. That’s to cover, for instance, any builder, private landlord, caterer, educational or training organisation, health & safety consultant, entertainer, financial or travel adviser, medical or healing practitioner or any other kind of consultant who might want to be a councillor now or in the future. Which looks like the electorate will be faced with an electoral choice in May restricted even more than at present to pensioners who are lucky enough to have a pension that they can live on without working.